Special Containment Procedures: Due to its nature as a phenomenon, SCP-195 cannot be contained directly. Therefore, efforts should be focused on understanding the phenomenon and exploring its possible uses, while limiting civilian access where possible. As leaving the continuum once entered is nigh-impossible unless prepared in advance, any trespassers entering a guarded access point are to be considered lost and neutralized. To this end, guards are advised to conduct only remote surveillance of the immediate area of access points, via stationary cameras or remote-controlled aerial drones, and are to stay well clear of any structurally unstable areas or discontinuities of the ground. Failure to do so will be its own punishment, therefore disciplinary actions will not be required. In cases of emergency where one must enter the area, guards are advised to carry a photograph of their residence or other location they are intimately familiar with. Ideally, such locations would be in sparsely frequented areas, and would possess one or more telecommunication facilities, basic medical supplies, and rations. The Foundation will assist anyone requesting in establishing and supplying such a location, within reasonable limits. Description: SCP-195 appears to be a separate continuum of space-time intricately intertwined with our own. Access to this additional continuum seems to be limited to certain locations, which can best be described as 'abandoned', though exact criteria are unknown. However, all points of access discovered so far have shared one feature, in that they all possessed a way 'down', whether it was a manhole, a stairwell, or a simple sinkhole. In this respect, SCP-195 appears similar to SCP-470, with the significant exception that it does not reproduce locations on Earth, but provides access to a separate continuum. Also, due to SCP-470 has, to date, not manifested locations which possess the required access points, it is presently unknown whether SCP-195 can be entered from within. Once a subject enters the continuum comprising SCP-195, all tracking is lost. Additionally, GPS receivers cease to function inside the continuum, citing no satellite lock, regardless of time spent trying to acquire a signal, or the location of the attempt. Communication with the inside world is possible, although it relies heavily on coincidence, or requires significant planning, as the only discovered method involves leaving messages to future visitors significantly in advance. Radio waves propagate as normal inside SCP-195, provided they originate inside the continuum, making communication within the phenomenon possible, even across long distances, if enough power is provided for broadcasting. All personnel are to carry communicators, and monitor both team and distress channels for broadcasts. SCP-195, once entered, can be considered infinite, yet of a finite size: one can proceed for any amount of time in a given direction (barring obstacles, which are frequent), and return to his/her starting point in a finite amount of time after traveling a measurable distance. Mathematicians theorize this to be due to the continuum conforming to radically different geometries (specifically, an approximation of the polar coordinate system) globally, while maintaining a close approximation of euclidean geometry locally. This means that exit is virtually impossible, apparently only facilitated by a realistic reminder of a location highly familiar to the explorer, the reason for which is presently unknown. When exit is required, all an explorer apparently has to do is to travel to his or her 'exit location', and remind themselves of it in reality via a suitably realistic reminder (eg. a photograph), at which point they will abruptly transfer back into our continuum through a poorly understood mechanism, which does not seem to release or require any energy or exotic matter, making it indescribable using current physical theories. The interior also demonstrates regular discontinuities in its geometry, which do not translate into perception: the horizon is always visible, barring obstruction, but if an explorer attempts to travel longer distances (approximately two kilometers from an access point, but can vary significantly), they will find themselves in another part of SCP-195, without having traversed the intervening space. The process is reversible, and well-reproducible, pointing to the existence of some sort of 'border' or 'barrier' separating domains around the access points, which warp geometry to bring globally distant points locally close without actually altering the structure of the intervening space. 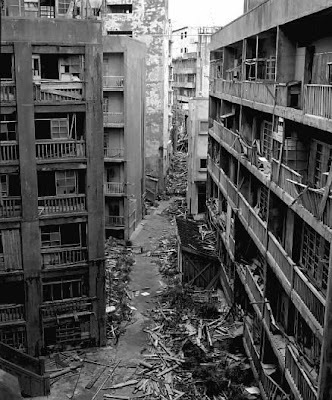 The locations one encounters inside SCP-195 are all characterized by various states of disrepair, and, for lack of a better word, abandonment. Metallic structures exhibit various levels of oxidation, while concrete is usually seen intact, only occasionally losing integrity. No human indigenous activity, nor any fauna has ever (see Incident SCP-195-11) been observed, but flora has been identified as terrestrial plants compliant to the local environ. Occasionally, vehicles and facilities will be present, but in various degrees of disrepair and vandalism, and most often will be without a power source, fuel, or crucial parts, or damaged to various degrees. While operating such devices is possible, time constraints usually prevent full repairs. Also of note is the fact that all scenery within SCP-195 is an unsaturated, essentially a greyscale image. This, however, does not apply to explorers, or to the reminders of exit locations carried by explorers, which, however, never fade. The reason for this is unknown as well. The Foundation was alerted to the existence of SCP-195 after Agent Perez disappeared while attempting to re-contain SCP-███, which has escaped into a part of █████████████, Guatemala, abandoned for several decades. Agent Perez was declared MIA, presumed killed, until he re-emerged four years later near his suburban home, approximately 430 km from his disappearance, and [DATA EXPUNGED]. Once his identity was verified, he was debriefed. The interview may be viewed as document SCP-195-21. SCP-195-01: Foundation Exit point Haven-420 was compromised by a team of four individuals on ██-██-20██@2318. Agents dispatched have apprehended suspects, who claimed to be Research team Sierra-Gamma-Charile 1123, dispatched three months beforehand to assess the time-distortion effect of SCP-195. Facial matching, DNA reverse engineering, and thorough questioning have confirmed their identities as members of said research team, dispatched in 1967. The team's chronometers confirm the passage of 90:07:26:38.5698, relatively. Further stay in SCP-195 is to be limited to no more than one week. SCP-195-11: After transiting into SCP-195 using a flight of stairs in an abandoned building in █████████████, Russia, Agent Hendricks reportedly spotted a figure in the building opposite their own. Upon arrival, he instructed his team members to remain concealed while he investigated. Crossing the street, he tried hailing the figure using his communicator on the distress channel, but received no response. Upon entering the building, he proceeded to search the floors systematically, and encountered a lone man wielding a 9 mm handgun, who he shot in self defense. After examination, the man was discovered to be in the employ of Marshall, Carter & Dark. Investigation into further exploration by Marshall, Carter & Dark agents pending.